Every year Buffalo Trace releases a group of whiskeys under their Antique Collection brand. These whiskies are all quite special, in limited quantity, and can be very hard to come by. The collection is released in September/October each year and within a month can be almost impossible to find. George T. Stagg has always been one of the biggest and boldest releases in the Antique Collection. Presented at high proof (typically between 140-150 proof), George T. Stagg is an incredible and intense experience. Each year the lots selected of George T. Stagg vary and so each year’s release has its own distinct character. For 2012, George T. Stagg was sourced from Buffalo Trace’s H, I, K, and L warehouses from spirit distilled in the spring of 1995. This year, the whiskey comes in at 142.8 proof, an exceptionally high proof for a bourbon (considering that legally a bourbon must be put into the barrel no higher than 125 proof). As with years past, George T. Stagg is presented as barrel strength with no dilution or filtration (which we feel is essential to making George T. Stagg what it is). 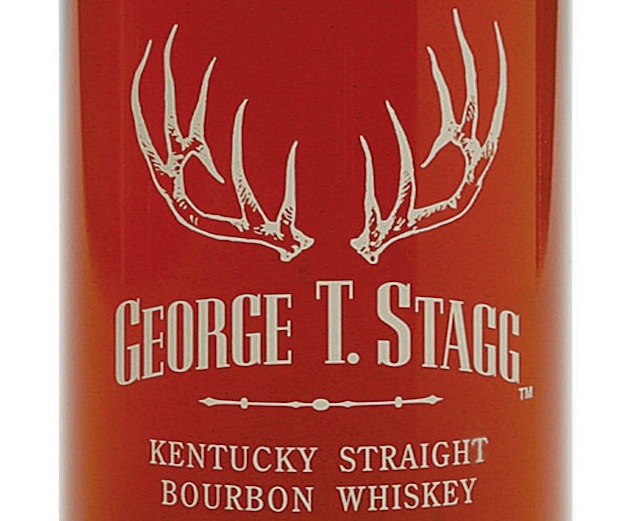 George T. Stagg Bourbon (142.8 proof / 71.4% ABV, 17 year old whisky) is more chocolatey in the nose than in years past. The dark chocolate notes are joined by marzipan, vanilla, cinnamon, and, of course, oak. It’s high proof so the strong alcohol vapors are there, but a little less agressive than the 2011. The entry of George T. Stagg is a flavor explosion, delivering flavor moments before it his your mouth without stopping until long after it’s finished. Oak spice leads things off but quickly steps aside for sweet vanilla/caramel, toasted pecan, and dark chocolate. Heat and spice really begin to take off as Stagg’s signature punch hits at the end of the midpalate and carries it through a long and spicy sweet finish that brings together oak spice, a bit of bitter dark chocolate, and sweet caramel. The mouth feel of George T. Stagg is exquisite and this year’s release leaves a thick chocolate caramel note on the palate in the finish. The 2012 George T. Stagg does benefit from adding a couple of drops of water into it. Things open a bit in the midpalate and the dark chocolate notes intensify. We don’t recommend using ice with George T. Stagg as part of the whole point of this whiskey is to experience liquid fireworks, but if you do, be sure to use an iceball or other hard packed piece of ice. As strong as 2012 George T. Stagg Bourbon is, there’s something slightly mellower about this year’s release. The classical aggressiveness is there, but there’s also a sense of restraint somewhere in the midpalate that we haven’t seen from George T. Stagg. It’s not enough to change its status as one of the premiere powerhouse bourbons, but it’s noticeable. It’s an interesting side step and perhaps a slightly softer introduction into the explosive Stagg universe. Stagg is still one of the most flavorful and exciting whiskeys on the market and this year’s release is no different.